Local performers will have their work cut out for them as they bring to life Rick Elice’s vision of Peter Pan’s origin story on the boards of the Callaway Theater. Fans of JM Barrie, who created Pan, Wendy, the Lost Boys and Captain Hook,will find in this some familiar faces and unexpected twists. Among the many issues to be resolved is the question of who is the meanest, dirtiest captain on the high seas. SAAC veterans Joel Cheshier and Clay Callaway, in their roles as Captains Stache and Slank will settle the once and for all, assisted (or hindered) by bumbling assistants Smee and Mack, played by Rhett Davis and Bob Stephenson. Both captains, for very different reasons, take an interest in the fortunes of the anonymous “Boy” (EHS junior Camden Jones) who will, before long, have a very familiar name indeed. Boy’s companions and fellow orphans Prentiss and Ted (SAAC intern Josie Denson and SAU student Callie Blair) simultaneously comfort and stifle him as they work out their own issues of ambition and pudding obsession. The story’s comical chaos is further knotted by the appearance of at least one bona fide historical figure amongst the fantastical characters: Captain Robert Falcon Scott, British explorer of the Antarctic (Jonathan Randle) who, for all his naval prowess, spends a fair amount of his stage time in captivity along with his fellow officer Lord Leonard Aster (Ty Lewis). Lord Aster is, no doubt, less historically accurate and yet will feel fondly familiar to fans of British programs on PBS as will, in a much more similar fashion, Hannah Davis’s character, the odious schoolmaster Grempkin. True to SAAC’s tradition of opportunities for young actors, the show features a gaggle of possibly Italian, possibly Samoan, but definitely fierce “Mollusks” (Carmelo Brown, Gracie James, Isai Hurtado, and Diego Valero) who are determined to offer a hearty meal to their beloved crocodile. They’re joined in the jungle by the equally truculent father and son team of Fighting Prawn and Hawking Clam, portrayed by Camden’s Luke Ramsey and Junction City’s Blake Goff. All of the nautical testosterone leaves less space for a feminine element on stage, but room is left for three actresses to bring to life the show’s empowered women. SAU Tech’s Lauren Peck graces the stage in nearly every scene as Molly, an aspiring superhero, loyal daughter, martial artist and romantic interest who is fluent in both Norwegian and the probably now extinct language known as Dodo. True to the literary tradition that behind every successful schoolgirl is a saucy Nanny, Molly is joined in her quest by Betty Bumbrake, played by Cherie Bright in her return to the local stage, where she will be wined and dined by Bill Osteen’s charming sea dog Alf. Local stage veteran Addie Bosanko is also featured as a somewhat unorthodox Scottish teacher. Rounding out the cast are local thespians and roustabouts Holland Ruff, Austin Groves, Jessica Raines, and Juan Perez. 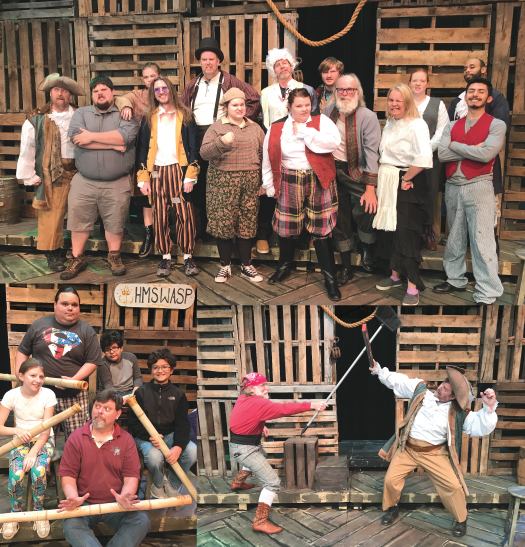 Don’t miss the opportunity to get to know all these characters during Peter and the Starcatcher’s six-night run, November 1-6. Tickets are available now at the SAAC box office, and are $20 for general public, $10 for members, and $5 for students. Call Box Office at 870-862-5474.